It’s almost always best to hire professional arborists to remove or cut down a tree for you. If you’re determined to tackle this work yourself and would like to keep the equipment you need on hand, you’re going to have to spend a decent amount of money. In order to cut down a tree safely and efficiently, you will need several things. Learn more about what you should buy to remove a tree below. Don’t want to DIY? Get free quotes from a pro. There’s no easy way to cut down a large tree without a decent chainsaw. In the case of very small trees, an ax might suffice. At any rate, you’ll get the work done more quickly with a chainsaw. 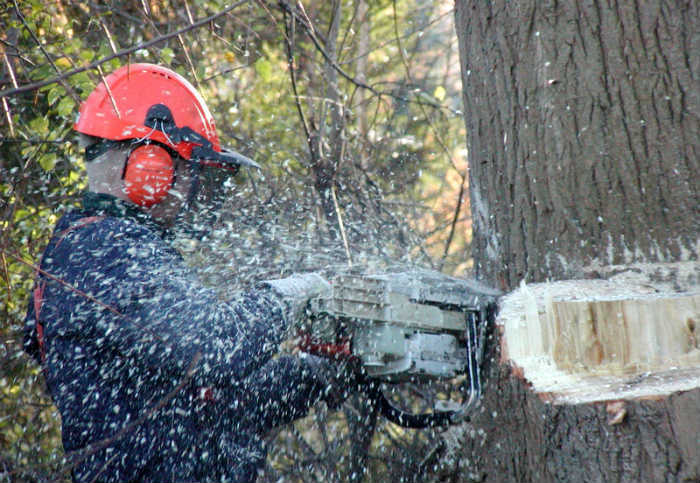 There are two main considerations when choosing a good chainsaw: gas versus electric. Gas-powered chainsaws offer more mobility, but calculating the right ratio of gas and oil can be tricky. Some people may oppose a gas chainsaw because it’s not as good for the environment and you have to pay extra for gas. Electric chainsaws eliminate these problems, but you might have to use extension cords to reach the tree that you would like to remove, which, aside from potentially being a nuisance, could pose other problems. For example, if you’re not able to access an electrical outlet you’ll be out of luck and potentially out of a job. As far as price goes, it largely depends on how powerful the chainsaw is. Obviously the more powerful a chainsaw is, the more expensive it will be. There are models that cost as little as $150, but most of them are too lightweight to handle the work of felling a good-sized tree. You should expect to spend between $300 and $400 on a chainsaw that’s capable of handling this kind of work. Ladder – If the tree is extremely tall or near obstacles, you will have to rope it down. To reach higher parts of the tree, a ladder is crucial. Rope – You’ll need rope to safely pull down sections of the tree. Take care to use the right technique. Ax – You might get away with using an ax if a tree is small or rotted enough. It pays to invest in a high-quality model. Wedges – Combined with an ax and chainsaw, this will help make the whole process easier. Safety Equipment – Whether you use an ax or a chainsaw, you need to protect yourself while doing this type of work. Purchase a hard hat, work gloves, work boots, eye protection and ear protection. First Aid Kit – It’s always good to have a first aid kit handy in case of an emergency or minor accidents. What are you going to do with the pieces of the tree after it’s chopped down? If you have money to burn, you might spend it on a residential wood chipper. A small wood chipper will cost around $750 while a large wood chipper will cost around $1,500. It only makes sense to buy one if you regularly need to turn timber into wood chips. Another good option for smaller trees is to get a trailer if you’ll need to haul away the tree debris.